If you're here for the SKETCH CHALLENGE BLOG HOP, please click HERE. This weekend, I was finally able to dig out from my garage the old box of watercolor supplies that I haven't visited since I moved to my "new" home 5+ years ago. I was delighted to see that most of the tubes of paint hadn't dried out, and that even those that had dried, I was able to chip off pieces and reconstitute to use well. Delightful! I wanted to try using the paints on a rubber stamp instead of ink, and then paint in highlights. Here is the birthday card I made using this technique. 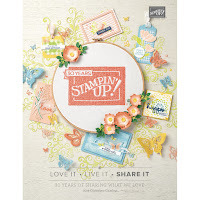 The stamp is a Stampin' Up hostess set that I purchased as recycled from a Facebook (and blog) friend, Nicolette. I participate in the "~Get It Sold~" group on Facebook, where crafters resell their unwanted goodies to others of us hoarders. I really liked how I was able to control the placement of color and shadows with my watercolor brush versus using a Copic marker. I also like the kind of raggedy, unpainted edges of the leaves that gives this image a more vintage feel. I also like that my watercolor didn't bleed through to the back, leaving just the right amount of tint to the image. 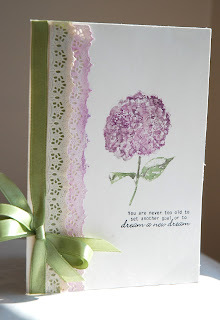 For the embellishments at the side, I diecut a border using Cheery Lynn Designs' "Anastasia border", using the same ivory parchment cardstock I used for the card. I washed it in the lilac paint, heavying up at the tips of the border cut. I then cut another piece of the Anastasia border, using the same paper I used in the inside, and lined it with a piece of the beautiful sage-colored satin ribbon from Mei Flower. 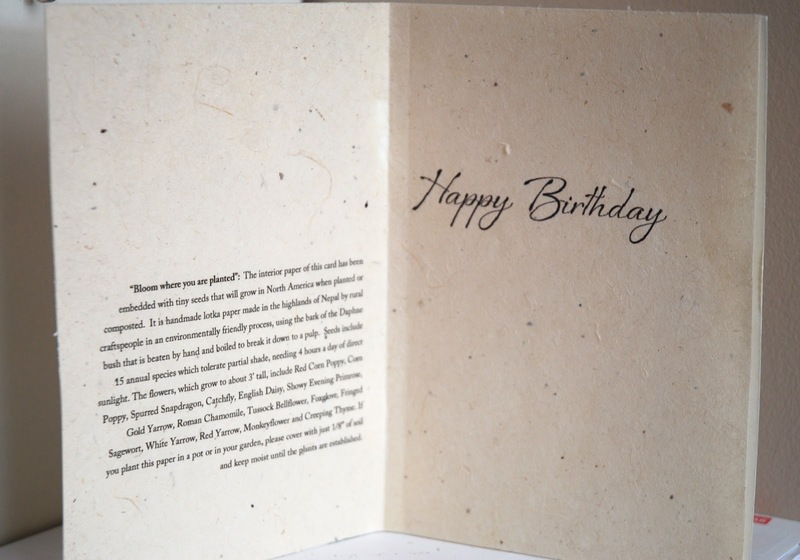 I used handmade seeded paper from "Of the Earth", computer-generating the sentiment and the description of the paper. "Bloom where you are planted": The interior paper of this card has been embedded with tiny seeds that will grow in North America when planted or composted. It is handmade lotka paper made in the highlands of Nepal by rural craftspeople using an environmentally friendly process. They use the bark of the Daphne bush, beating it by hand and boiling it to break it down to a pulp. Seeds include 15 annual species which tolerate partial shade, needing 4 hours a day of direct sunlight. The flowers, which grow to about 3' tall, include Red Corn Poppy, Corn Poppy, Spurred Snapdragon, Catchfuly, English Daisy, Showy Evening Primrose, Gold Yarrow, Roman Chamomile, Tussock Bellflower, Foxglove, Fringed Sagewort, White Yarrow, Red Yarrow, Monkey Flower and Creeping Thyme. If yo plant this paper in a pot or in your garden, please cover with just 1/8" of soil and keep moist until the plants are established. I got this neat, beautiful paper from Save-On-Crafts. 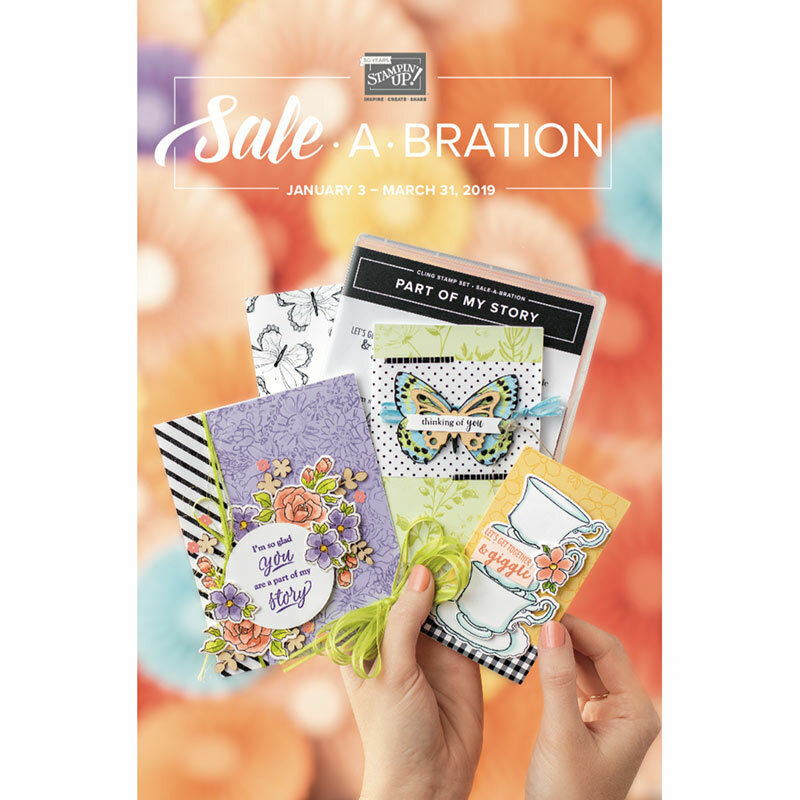 It is $10.99 for 25 sheets (8.5"x11"), or $10 each for 3 packages. Here is the LINK to the paper. I so enjoyed your blog today-both the project and the comments. And what an education I got! I didn't know there was a monkey flower either! Oh Ellen, LOVE the watercolor card. And HEY you found them! The only problem with the seeded paper is that I'd have to PLANT your card, lol. NOT gonna happen. lol. Love the monkey flowers, so pretty. I'm gonna go google them and see if they come in other colors! 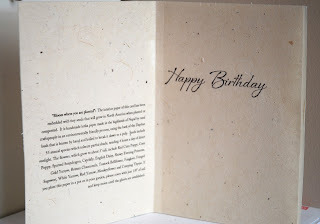 Love the card, great idea for the seed paper. Never heard of a monkey flower either! congrats on your win at territv. Love the card. Those sketch cards are awesome too. Glad u stopped by my blog ....thought I was gonna have to send u a map.lol. hugs. This is very pretty!! I love the soft colors and paper you used. Beautiful! !